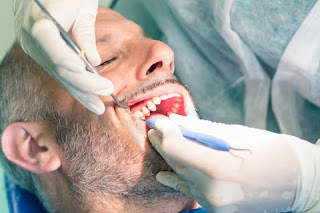 Cavities are the most common of dental problems. Even with the best oral hygiene practices, cavities can happen. One of the biggest problems with dental cavity prevention is the number of myths that surround the subject. Many of them are so common and well accepted that people tend to believe in them blindly, resulting in ignoring the real causative factors or in following the wrong teeth care procedures. To help you separate fact from fiction, here are a few of the myths and facts about cavities and related issues you need to know. This is only partially true. The fact is that cavities are caused by acid in the mouth. This acid is in turn, caused by the bacteria that exist there. Bacteria produce the acid by digesting carbohydrates and sugar, along with bread, potatoes, rice, fruit and vegetables, is one of these. Whenever you eat carbs, the bacteria produce acid. What is important is not the amount of carbs you eat, but the length of time your teeth are exposed to the acid. For example, if you sip sugary drinks all day long, your teeth are constantly exposed to bacteria related acids. Again this is partially correct. Acidic foods like lemons and oranges do not directly cause cavities. But the acids in them can erode the enamel that forms the hard outer layer of your teeth. When the enamel becomes eroded, the underlying tissue becomes exposed and is more prone to cavity formation. This is a myth. Yes, children do get more cavities than adults, but this is due to their careless attitude towards dental hygiene. If children are taught to care for their teeth properly, the likelihood of their getting cavities is the same as for adults. Partially true. Medicines do not directly damage the teeth. But many of them cause the mouth to become dry by affecting the production of saliva. Saliva is important in fighting tooth decay because it has disinfectant qualities, neutralizes acids and helps to wash out bacteria from the teeth. Less saliva means more chance of cavities. Myth. Aspirin is an analgesic that works to reduce sensation of pain when ingested. Placing it on or next to a painful tooth will not help in reducing the pain. In fact, since aspirin is acidic in nature, direct contact with the teeth and gums can cause abscesses to develop. Not always. An amalgam or composite filling can last a lifetime. They normally need to be replaced only if they become damaged, the tooth breaks or cavities form around them. If none of these happens there should not be any reason to replace them. It all depends on how you care for your teeth. In the next blog we will look at more myths and facts about cavities you need to know.